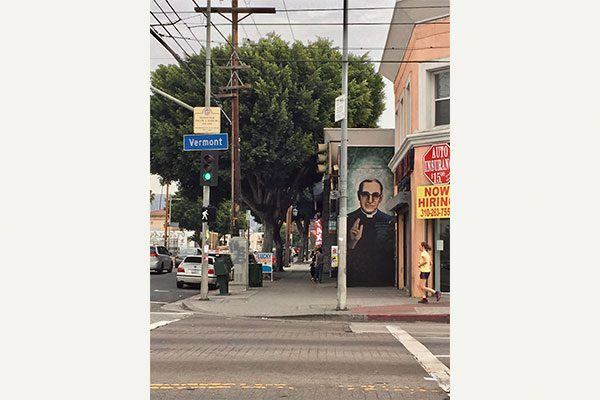 In Los Angeles, on the corner of Pico and Vermont, there is a mural dedicated to Archbishop Oscar Romero, whose 1980 assassination triggered the Salvadoran Civil War. The mural reads, “I’ve frequently been threatened with death. I must say that as a Christian I don’t believe in death without resurrection. If they kill me, I will be reborn in the Salvadoran community.” As if to prove this, the archbishop’s face appears frequently along the roughly 12 blocks spanning the El Salvador Community Corridor, from 11th Street in Koreatown to Adams Boulevard near the University of Southern California campus along Vermont Avenue. For this community, he is a symbol of El Salvador, hope, and the rebirth of a culture left thousands of miles away. More than other LA micro-communities, the corridor is dense with evidence of its micro-culture. The blue and white colors of the Salvadoran flag decorate nearly every store. There are business where you can buy pan dulce, charamuscas, and newspapers from home. Most of the 100 businesses here provide services that connect Salvadorans to their home. The corner stores sell calling cards. The banks are dedicated to remittances. Though the corridor sits in one of the most socioeconomically disadvantaged parts of Los Angeles, and though Salvadorans make up one of the poorest populations in the United States, with a median earning of $20,000 a year, money wired from here keep the home country going. El Salvador is a beautiful country with a violent history. Its devastating Civil War (1979-1992) claimed over 75,000 lives and drove the vast migration of Salvadorans to the United States. And it happened to drive them to precisely the country that was providing their government’s death squads with funding and political cover. Hundreds of thousands of Salvadoran immigrants would follow suit, seeking asylum, and many more come now. Though the war ended over twenty years ago, political and economic unrest continue to affect the country. Gang violence and economic instability — sometimes described as low-level civil war — continue to push Salvadorans to make the long and dangerous journey through Mexico to the United States. It’s hard to get ahead in the United States, but that’s preferable to the difficulty of surviving in El Salvador. To get by here and still send money home, many Salvadoran immigrants work double the hours of their American counterparts, working multiple jobs as nannies, maids, gardeners, and fruit vendors. It’s a remarkable balancing act of labor and frugality. The contributions that Salvadorans living in the United States send back home to their family members account for close to 20% of the Salvadoran Gross Domestic Product. One in every three households in El Salvador receives remittances from family in the United States. Paradoxically, one of the poorest populations in the United States is helping keep their home country from collapsing with every contribution of $30 for their cousin, $60 for their grandmother, adding up to billions for the homeland. The corridor serves as a small comfort to these heroes. Traditional colorful dresses and jerseys supporting the Salvadoran soccer team adorn the front of clothing stores. Older women sit at fruit stands, offering bags of sliced mango for $2 and gossiping with each other in their unique Salvadoran drawl. Restaurants and bars blast Salvadoran music, and it’s difficult not to be moved to dance along with the infectious smiles on everyone’s faces. For a moment, it feels like you could step outside into the home country’s lush greenery, rather than LA’s endless concrete. The Archbishop’s wishes, then, have come true in a way, as prophecy, with El Salvador being reborn every day in LA.